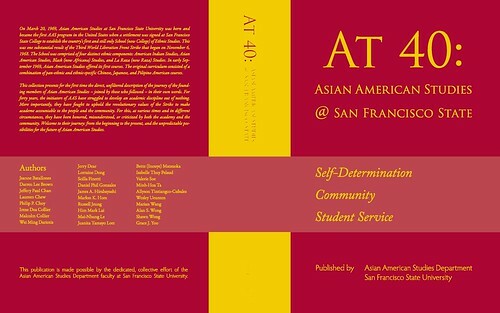 On March 20, 1969, Asian American Studies at San Francisco State University was born and became the first AAS program in the United States when a settlement was signed at San Francisco State College to establish the country’s first and still only School (now College) of Ethnic Studies. This was one substantial result of the Third World Liberation Front Strike that began on November 6, 1968. The School was comprised of four distinct ethnic components: American Indian Studies, Asian American Studies, Black (now Africana) Studies, and La Raza (now Raza) Studies. In early September 1969, Asian American Studies offered its first courses. The original curriculum consisted of a combination of pan-ethnic and ethnic-specific Chinese, Japanese, and Pilipino American courses. This collection presents for the first time the direct, unfiltered description of the journey of the founding members of Asian American Studies—joined by those who followed—in their own words. For forty years, the initiators of AAS have struggled to develop an academic discipline out of nothing. More importantly, they have fought to uphold the revolutionary values of the Strike to make academe accountable to the people and the community. For this, at various times and in different circumstances, they have been honored, misunderstood, or criticized by both the academy and the community. Welcome to their journey: from the beginning to the present, and the unpredictable possibilities for the future of Asian American Studies.